When shopping for a future baby the big items like cribs and dresses usually enjoy the most attention. That is understandable because it is those that come to mind. The small things shouldn’t be forgotten though because they could be just as important. An item like the burp cloth can be one such very important purchase. It’s there for varied and practical purposes. Because it will be used each day, all options should really be carefully considered before it is bought. Thankfully this article will help you to make the right choice so that you buy the best burp cloths. What is a Burp Cloth? Burping is a common occurrence for babies. When a mother holds a baby to help with a burp it can come as spit. So the burp cloth is made to cover a shoulder so that the clothes aren’t spoilt. The cloth has to be long-lasting and absorbent. The burp cloth should also be soft enough and not fade too much after repeated washing. The type of material shouldn’t attract dirt either. It has to be big enough to cover the front and back of a shoulder. Look at the different prices and see if there is one price that fits you. At times a burp cloth can also be used as a diaper cloth or even a diaper itself. The best burp cloths have many more uses than just guarding against drool. 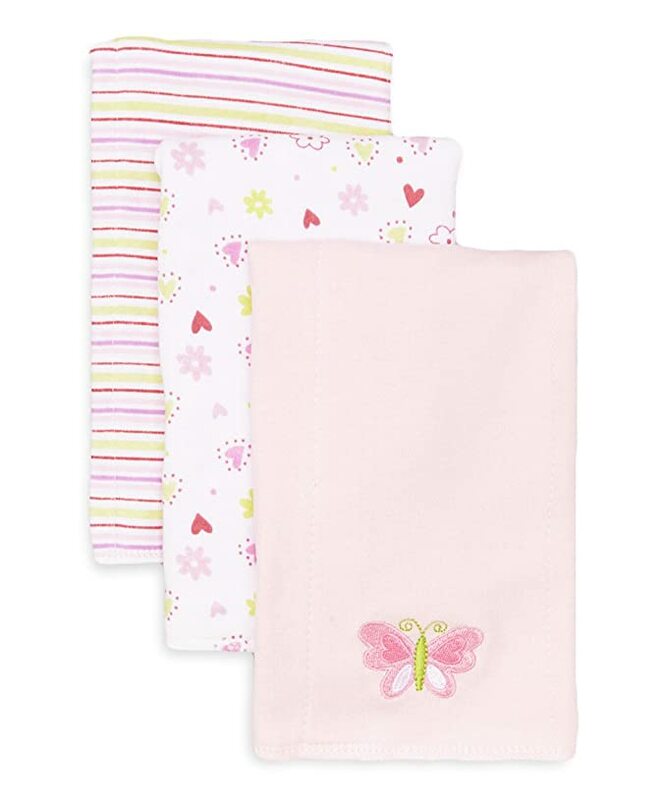 Burp cloths can be used as bathtub cleaners, a dust cloth and as an impromptu bib for the baby. An important distinction between the different cloths lies largely in the different materials that it consists of. Some are made of cotton, cotton/polyester blend, hemp, fleece, muslin, and terry. Finding out what the type of cloth is an important part of buying the best burp cloths. They also come in a variety of shapes: kidney-shaped, rectangular and curved. The way to use a burp cloth is to wash it each time after use. This is one of the reasons why there is normally more than one per pack so that one can be interchanged if one is filthy at the moment. If you don’t want to spend money on a burp cloth then you can make your very own. By doing this you can personalize them to fit your own needs, and add a personal touch. Cotton is a very good material to use for a burp cloth. Just remember to add another layer, as cotton is very soft and very absorbent. Washing and ironing the material is a good tip, as it could shrink. You can then cut the cotton in squares and stitch them together. Adding your name, colours and patterns on top of the cloth is a nice touch for setting your burp cloth apart from the rest. 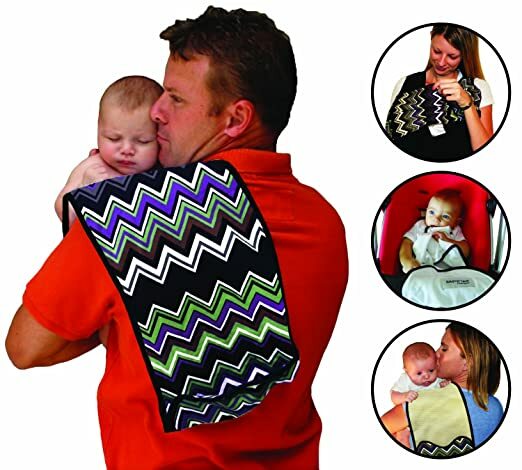 The Baby K’Tan Burp Cloth has 4.5 stars on the Amazon rating system. The price for this is about $8 for one cloth. Can be used as burp cloth, stroller blanket and nurse blanket. Mesh-absorbent microfiber, so not as soft as cotton. Verdict: Though it is very versatile, it is a bit undermined as a burp blanket by the fact that it isn’t as soft as most other blankets. The specific Born Free Soft Clean Burp Cloth has 4.8 stars on Amazon. It costs around $9 per blanket. Soft muslin front that gets softer each wash. Shaped to fit easily on the shoulder and lap. The bottom is made of terry, so it is anti-slip. Muslin can detach at the seams from too much washing. Not a lot of colour options to choose from. Verdict: It is a thick and absorbent burp cloth. What is a little worrying is the fact that it can come away at the seams after many cycles of washing. The product has 4.5 stars on Amazon. It costs slightly over $7 for a 3-pack set. As a result it is soft and absorbent. It has 3 pieces of cloth in one pack. No discoloration, even after many years of washing. Not as absorbent as some of the hybrid materials. They shrink as they are used over and over. Verdict: Very reasonably priced and soft. One can also rotate use between three pieces of cloths. One thing to keep in mind is that these will eventually shrink later on. The product has a star rating of 4.5 on Amazon. It costs around $14 and includes 5 different cloths. A unique fluffy texture with bumps. Really soft like a comfort blanket. A huge distracting logo at the front. One cannot choose individual colours for each blanket, but has to be satisfied with what you get in the pack. Verdict: The price may be a bit higher than a lot of options, though one actually gets 5 products in one pack. It is even more smooth and fluffy than many burp cloths. The product has 5 stars on Amazon. The price is about $14 and it contains three different cloths. It has 4 different layers that absorbs and protects anything. Made from 100% organic cotton muslin. Wash up very well and patterns and colours remain pretty. Very large, so it covers a big area. Bit thinner than other multi-layer cloths. Verdict: Though it is quite expensive one gets serious peace of mind from knowing that it is totally organic. It works really well as a burp cloth, and the colours are really pretty. The winner of the roundup is green sprouts Muslin Burp Cloths. If one can afford it, then it is clearly the best option from all of them. One wants to use the very best when it comes to your child and this product is it. 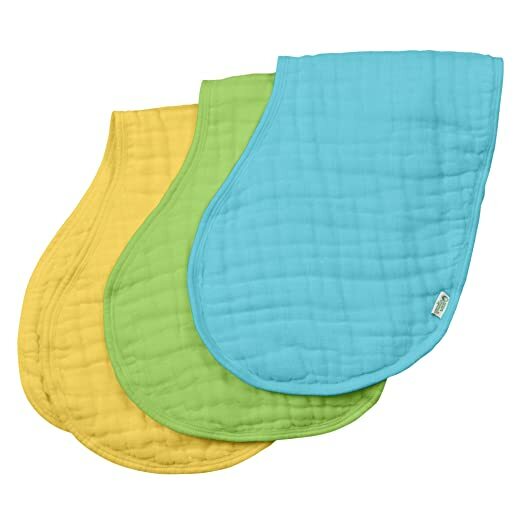 All natural and very soft, it does everything that a burp cloth should-absorbent and very washable, while also covering a big area. The bright colours would also cheer up anyone. Hopefully, this article has been very informative and has made you think about how to approach the matter of identifying the best burp cloths.